On a Saturday morning Keith informed me that there was a creature in the guest bathroom. I am the official creature re-locator of Towerwater. Sometimes I think Keith is the official creature spotter of Towerwater. I don’t mind the creatures but agree they will have a much better life outdoors. I don’t like ‘daddy long leg’ spiders. They can be embarrassing. Especially when I have planned a dinner party and with my final inspection of the table settings, spotting a fresh cobweb in the chandelier above as the guests arrive. The whole evening I am then painfully aware of that one intrusive cobweb introduced by my friend the long legged spider. Expecting a creature of the spider kind, I walked into the bathroom with a brush and dustpan to make a quick extraction of the intruder and release it into the garden. 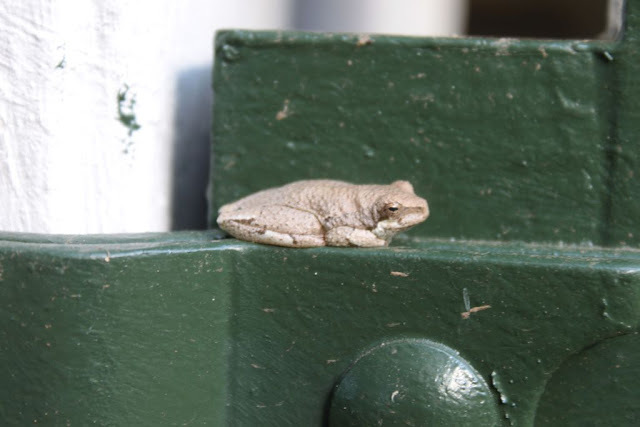 To my surprise it was a very pale frog sitting on the basin, nearly completely camouflaged against his background. I felt sorry for him, thinking that he had lost his colour due to an extended stay in the darkened house. 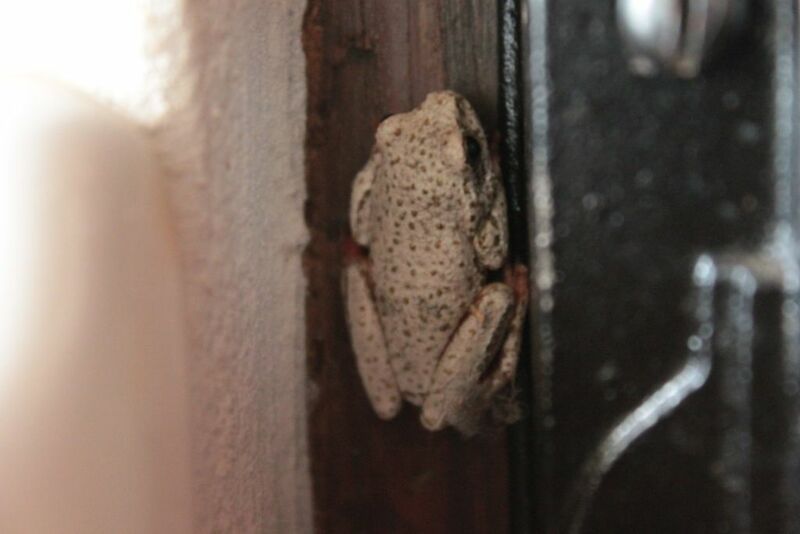 I am used to toads coming into the house in the evening when they are initially attracted to the insects clouding around the outside lamps before taking the opportunity to slip into the house. 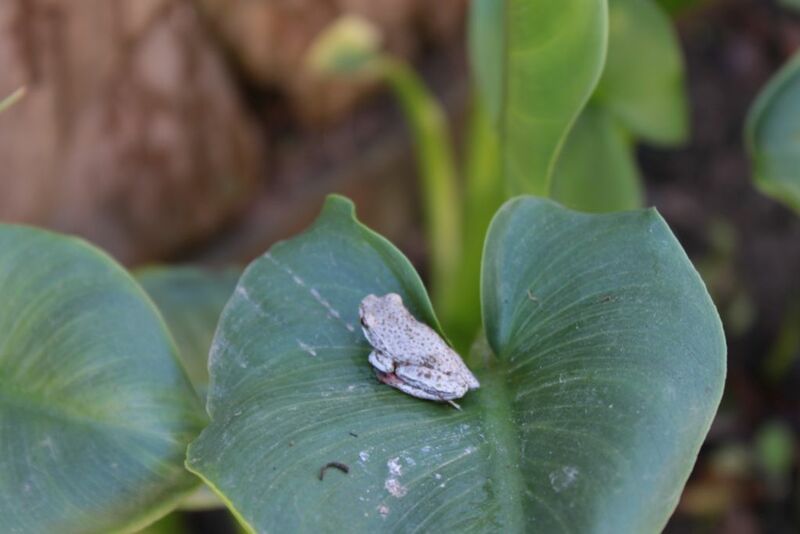 The small white frog on the basin was clearly not impressed with the newfound interest that I was showing in him. When he started to move I had another fright because his feet were red. I thought he might have hurt himself, but I soon discovered that this was his natural appearance. 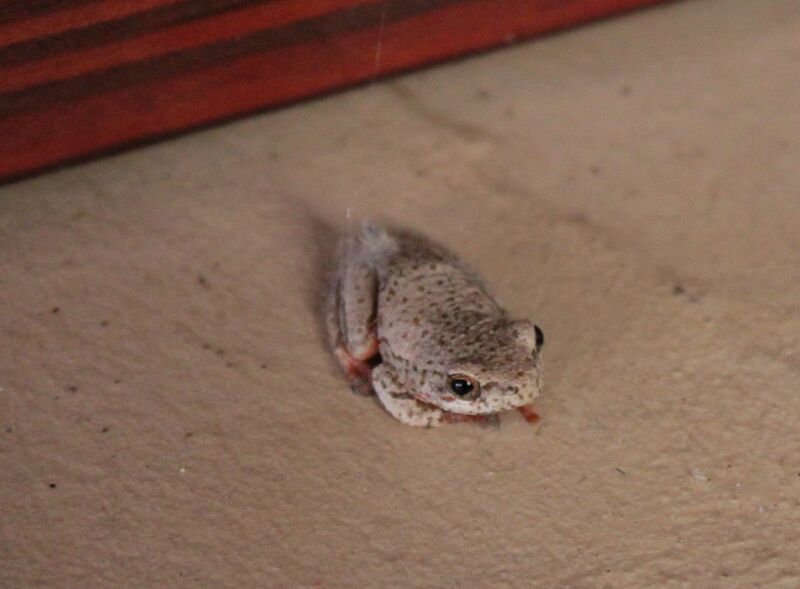 “Oh Lord, I have an endangered poisonous frog in the house,” was my first thought. How does one handle poisonous frogs? Well, it was time to Google this one. 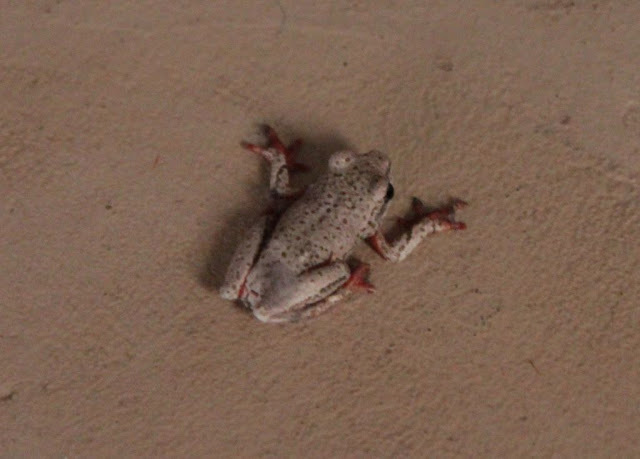 A quick search for ‘white frog with red feet’ did not only give me a picture that matched the creature in the bathroom, but I was informed that what I had in the bathroom was an Arum frog. I discovered that it was endemic to South Africa. Found in the southern coastal plains of South Africa from Cape Town to Port Elizabeth. They are not endangered. I was happy that at last I had a frog for my arum lily patch that was just sprouting for winter. They apparently like to hide in arum lily flowers where they can change colour to perfectly match their surroundings. This makes them virtually invisible to predators, as well as to their insect prey. 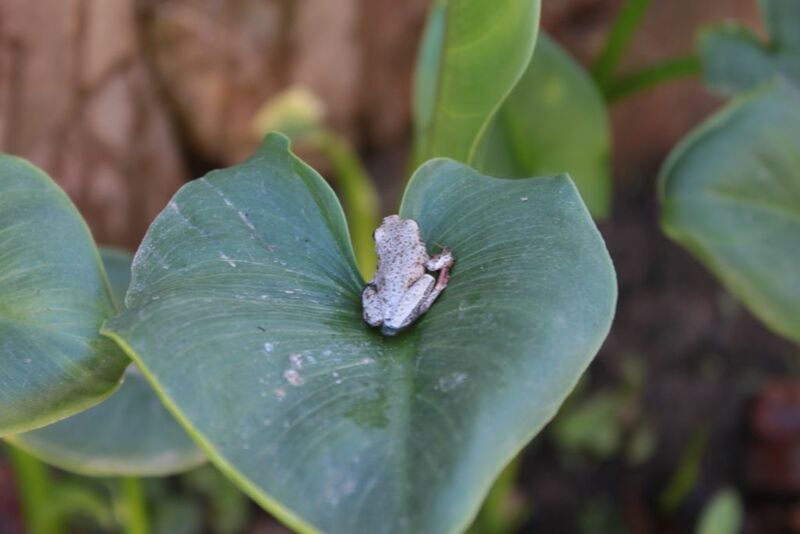 Now I was ready to relocate the frog to the perfect place for him in the garden. Back in the bathroom I discovered that the frog was gone. After searching the complete floor and not finding him I looked up and saw him crawling up the doorframe like Spiderman. I let him jump into my slipper and carried him off to the corner of the garden where the arum lilies were sprouting. I left him happily sitting. Later in the day he was not to be seen. Happy that I have a new friend in the garden, I hoped that he had found a spot where he could be happy. 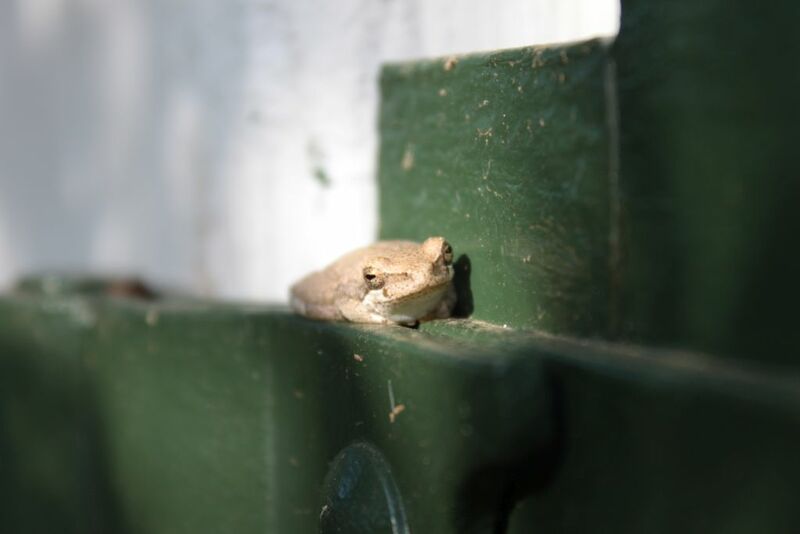 A few mornings later, I found him sitting on the gate to the garden office but decided to let him be. He obviously knows where he wants to be. It suits me as long as it is not in the house. A new friend I had not met before. Thanks for shedding light on the subject.